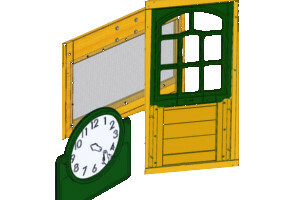 Click the button that relates to the part of the climbing frame you need help with and you be back to building in no time. This section includes all the central parts of the climbing frame. When this is complete it's what all the other parts will join on to. Before you begin check you've got everything ready in your garden, moving a climbing frame isn't half as much as playing on one. Take the LT Post Assembly (2757) & RT Post Assembly (2758) with the notches facing down and tap in the T-nuts (TN2 for Top holes, TN1 Middle and bottom). Flip the posts and place two siding assemblies on top fitting flush abouve the groves. Then insert cross supports into place (2630 Top, 2768 Middle, 2769 Bottom) Making sure the frame is square and flush attach them with four wood screws (S30) per board. Use two Wafer bolts in the top beam. Two Hex Bolts with lock washer both with flat washer connecting to previously insalled T-Nuts. Attach the right diagonal on the bottom (2607) and (2778). With all four sides ready have someone hold the swing wall as you bring the front wall to the side where you left off the diagonal make square and secure into place with four wafer Lags per side (WL5). Bring in the back wall secure and finally the end wall which will have eight (WL5) wafer lags in four on each side. Finally attach the left diagonal making both sides secure. This folows a similar process use end posts (2771, 2770) lay them with groves up and in. Three cross supports (2775 Top, 2772 Middle, 2769 Bottom) make the frame square attach with four wood screws (S30) per board, tap in three T-nuts into the top and middle cross supports and two in the bottom. Panel Floors in the Swing and End Walls, measure 5/8” (15.9 mm) down from the top of boards then attach (2608) Floor Joist to each board using the left and centre holes with 2 (S4) Wood Screws per board. Attach two t-nuts in each end 9" from the ends. Then secure into place on the back and front wall using the Hex bolts (H11) with lock & flat washer into the prevously installed T-nuts making sure they are level with the centre joist. Finnaly add in the wood screws and tighten the hex bolts. Remember no over tightening. All the floor boards are the same with the exception of the Swing wall floor board (2648) which goes into the swing wall end, then space out remaining floor boards (2609) and attach using five per board two in each end and one into the centre joist. Starting by attaching swing hangers to the beam using 2 (G7) Hex Bolts with two flat washers and a lock nut on each attachement. Flush to the fort end of the beam attach two L-beam brackets with two (G21) Hex Bolts flat washers and locking nut. Finally install one (WB7) wafer bolt with washer and t-nut in the middle hole of the swing beam, this will minimise checking of the wood. Gather the parts together and loosely attach two (2613) Heavy SW Posts to (2615) SW Upright using two (G7) Hex bolts with flat washers and t-nut) two bolt holes note the top of the centre upright (2615). Attach (2616) SW support the centre verticle piece onto the Heavy SW Posts and centre upright using three (G4) Hex bolts with lock washer, flat washer and t-nut and tighten all bolts. Install the waffer Bolts with flat washer and t-buts in the top bolt holes in (2615) centre upright. With the beam and swing end assembly ready lay the swing beam down with the attachments facing up and have the beam bracket on each side of the assemble and attach with five (G21) Hex bolts with flat washers and locking nut. 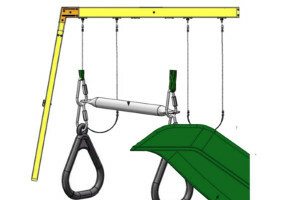 Three go in swing end assembly and two in the swing beam which is easily slotted into place by a second person. Place swing assembly against top of (2630) SW Top, make sure assembly is level and attach from the inside of the fort into the four holes in the L-beam Bracket with (G8) Hex Bolts with two flat washers and lock nut. Attach the end of the swing and acro ropes to the Threaded Clips attached to the swing hangers. Lay two Rock Rails (2776) down side by side with the angled edges facing down. Take the access board (2779) attach flush across the bottom of the rails (opposite end to the angles facing down) with four wood screws (S20). Then place boards marked 2781 and 2780 alternately up the ladder making sure the gaps do not exceed 60.3mm between boards. Placing the assembled centred in the opening as shown in your fort guide flush as shown in the video. Lastly add the last board at the top to complete the climbing wall. 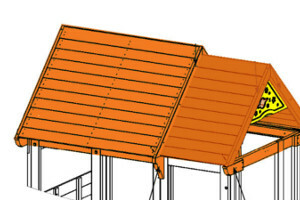 Attach the two (2760) Roof Supports at the peak using one (S4) Wood Screw. Repeat this for the two Roof Support Assemblies. Place 1 (2751) MOD Roof Bottom tight to the bottom of (2752) MOD Roof Front and (2753) MOD Roof Back. 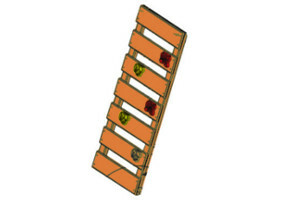 Place a (2761) Roof Sleeper C on the middle strip of each Roof Panel Assembly attach with four (S20) Wood Screws per panel. Bring the Roof Panels together so the tops form a peak tight to the inside edge of the outside slats. Use a Narrow Angle Bracket on each slat and fix in place with two (S0) Truss Screws per bracket. Put one Roof Assembly Support on the side of the roof panel's, make sure its all flush and secure in place with 8 (S11) Wood Screws. Attach the second Roof Support Assembly on the opposite side, with 8 (S11) Wood Screws. Attach 1 Sky Gable to the inside of the (2617) Roof Supports on each side of the Roof Assembly with 4 (S5) Pan Screws per Sky Gable. Remove the outside (H9) hex bolts from the end wall's top leaving the t-nuts (TN1). 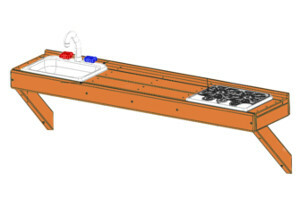 The flat (FW1) and lock(LW1) washers are used in the next step. Loosely attach 1 (2759) Roof End to each corner of the End Wall, flush to the top of (2769) Panel BT Frame, with 1 (H3) Hex Bolt per board, using the (FW1) Flat Washer and (LW1) Lock Washer from previous step, connecting to the (TN1) T-nut. Notice which bolt holes are to be used. Measure the overhang at 4-7/8” (124 mm) then attach with 2 (S11) Wood Screws and 1 (S3) Wood Screw per (2759) Roof End. Tighten the bolts. Attach roof ends to each corner of the swing wall, flush to the top with the 4-7/8” (124 mm) overhang attaching with two wood screw (S11) and one (S3) per roof end. Notice which holes are to be used. With 2 people on the ground and at least 1 person in the fort, lift the Roof Assembly up and over the Back side of the fort. Guide the Roof Assembly onto the fort so all four (2760) Roof Supports sit flush to the front and outside edges of (2759) Roof Ends. 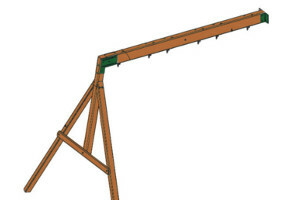 Attach (2760) Roof Supports to (2759) Roof Ends with 1 (S3) Wood Screw per support. Place (2612) Table Support flush to the notched out ends of (2611) Table Top and attach with 4 (S7) Pan Screws. Place Table Top Assembly tight in the opening of Back Wall with the overhang on the outside of the assembly as shown in fig. 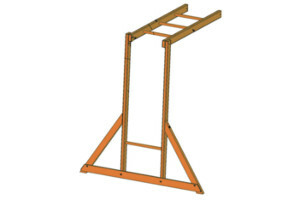 17.2 and in the Glee Fort Guide then attach (2612) Table Support to the Back Wall posts with 2 (S3) Wood Screws. Place the other two (5736) Counter Joists over the pilot holes in the middle of Counter Back, flush to the boards top, then attach the top holes, with one (S2) Wood Screw per joist. Place the Counter Assemblies (2687) Counter Back, flush to the top of the opening attaching with five (S2) Wood Screws. Place one (6136) Counter Brace flush to the outside front edge of each outer counter Joists tight to the Swing Wall and attach with two (S3) Wood Screws per brace. Place (2686) Counter Front against Counter Joists so the ends are flush and the centre counter joists are centred over the pilot holes. Measure 5/8” (15.9 mm) down from the top of the Counter Front on both ends and attach to the counter joists with four (S2) Wood Screws. Tight to the Counter Back attach (2685) Counter Top to each counter joist with 4 (TS) Trim Screws. Attach counter side (5536) to the outside of the outside counter joists. Tight to (2685) Counter Top and centred over the middle counter joists with ends flush to the outside edges attach two (2716) counter middle tops with four (TS) Trim Screws per board. Attach (2685) Counter Top to (2756) Siding Assembly with 2 (TS) Trim Screws. Place Faucet and 2 Sink Knobs in opening of Sink and attach Sink Knobs with included hardware. Place Sink and Stove in the openings of the Counter Assembly then attach 4 Mount Clips with included hardware to the bottom of the Sink and Stove to secure in place. Important: Use a hand held screw driver and DO NOT over tighten. Note: To remove the Sink or Stove loosen screw 1/4 turn then twist Mount Clips. With a helper hold the Canopy against the fort, on the Back Wall as shown on the Glee Fort Guide, measure 3-1/8” (79 mm) in from the outside edge of the (2770) End Post Left, making sure the Cafe Canopy is smooth and tight then attach to the post with 2 (S5) Pan Screws (with #8 flat washer), measure 1-1/2” (38.1mm) down from the first screw then attach a third screw and washer. Follow measurements as shown in fig. 18.2 for remaining screws and washers. Measurements must be exact. Hold the Cafe Canopy Frame against the panel and attach with 1 (S6) Pan Screw per side. Straight slide is one solid slide that is positioned in the forts opening as described in the fort section of your manual. Pre-drill a couple of holes before using a screws in each hole and your done simple. Along each side measure 4-1/2” (114 mm) down from the top screws and the same dimension up from the bottom screws then attach 2 (S5) Pan Screws (with #8 flat washer) per side to (2757) LT Post Assembly and (2758) RT Post Assembly. Along the top and bottom measure 6-3/8” (162 mm) in from the corner screws on one side then attach 5 (S5) Pan Screws (with #8 flat washer) to (2630) SW Top and (2756) Siding Assembly. Each screw to be the same dimension apart. In the notched out opening of (2715) Door Stop attach the Magnetic Catch using 2 (S18) Wood Screws. (fig.27.1) Important: Use a hand held screw driver and DO NOT over tighten. 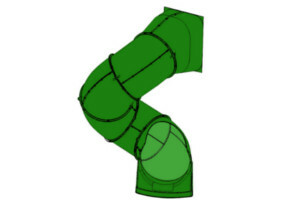 Attach the side insert flush to the front of the fort, secure into place and put pre-drill holes ready for the first section of the tube slide. Prepare the sections of the tube slide each is made of two halfs. Slot the opening section in the gap in the hole. Use ring clamps to join the differnt sections together. Make the up the tube slide suport and secure into place.